I have always been a dog person. My mother said when I was a baby in my stroller, I would get so excited and squeal whenever we came upon a dog. I have always had dogs, and most of the time more than one dog. I grew up with Poodles. I fell in love with Yorkies as a teen and began to show and breed them in the 80’s. After awhile, it seemed rescues and strays came my way so now I mostly own mutts. Except for my Chihuahua Kilo. I have actually known Kilo since she was a small puppy. My neighbors across the street bought her from a breeder when she was 6 weeks old. I remember wondering if that was a good idea being that they had 5 kids, 3 of who were under 5 years of age. I think I saved Kilo’s life at least a half dozen times the first half of her life. With so many people living in her house, she was always slipping out, either through the door or the backyard gate when someone didn’t close it properly. Since I work at home and am in my home office during the day, I would sometimes hear a little high pitched bark. 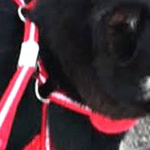 When I looked outside, I would see a tiny black dog barking her head off, standing in the middle of the road. Not a good idea on our road where, although the speed limit is 25 MPH, many speed by at about 50. There were times where I had to literally run out in the road with my hands flailing, trying to stop traffic because Kilo was so small and blended in with the color of the road, I knew drivers would never see her there. Then I would take her back to her house or if no one was home, take her to mine until her family came home. When Kilo was about 6 years old, her family moved away to Kansas and decided they couldn’t take her with them. They gave her to friends who had another small dog (can’t remember the breed). That only lasted a few days until these people brought her to us. They said Kilo and their dog didn’t get a long at all and they were told by our former neighbors to bring her to me if they couldn’t keep her. Huh? No one told me about this. They must have known I was such a softie that I wouldn’t turn her away. And I didn’t. I was assured that the neighbor’s oldest daughter would be picking her up in a few weeks. I already had 4 dogs at the time and really wasn’t thrilled taking on a fifth. But hey, it was only going to be a few weeks right? Well that few weeks has turned into 6 years. 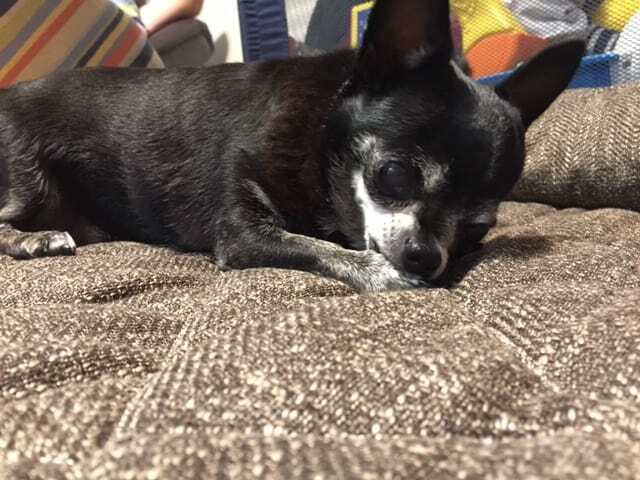 Kilo passed in July 2017 and though I have a new chihuahua and a chi-mix, I still miss her everyday. Through Kilo, I have fallen in love with the Chihuahua breed and would love to have a few more eventually. There is just something special about these little dogs. I hope you enjoyed my story. 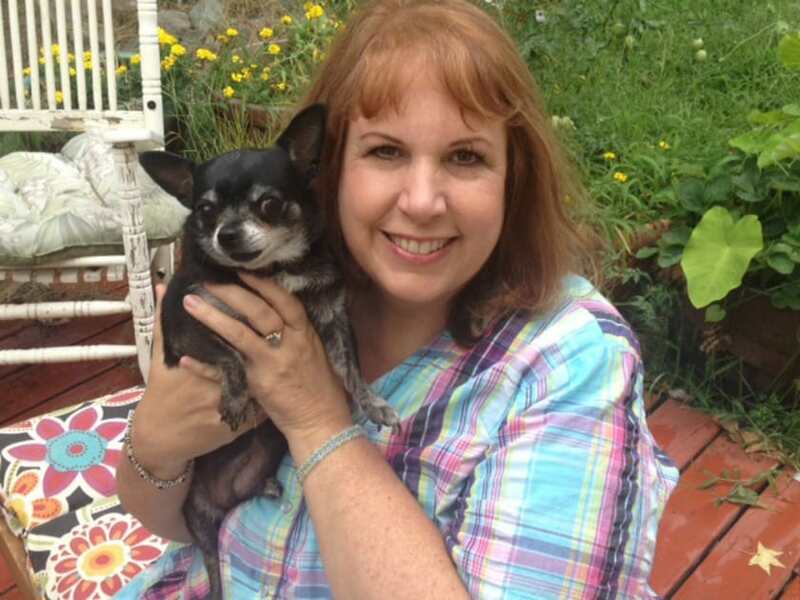 Remember, I’d love to publish your story too about your Chihuahua or Chihuahuas. 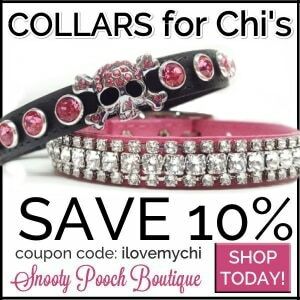 Email your story and any photos (we need at least one) you want to share along with it to cathy@ilovemychi.com and put Chihuahua Story in the subject line. My current chihuahua is definitely a rescue. Her name is Simmy (yes, original, but means a lot to me). She was 8 yrs old when I received her (as one of her owners thinks). I have had her since May 2013. She was wrapped up in a blanket and handed to me. After they left, I wanted to examine what I had taken on. She is the color of a siamese cat, (sort of silvery–tan–pink?) with ears trimmed in brown and one brown spot on one of her hips. Her back was caked in 1/8 inch of flea poop, but couldn’t find one flea. They told me she has been previously rescued from being behind a car that threw her out the window. Then she also said that her brother threatened to shoot her as he thought she was very annoying. I cleaned her from head to toe, and the 8 yr old dog became a puppy again. Yea! She did seem to have a hip problem, but that was minor. However, I wondered why she wouldn’t respond when I would talk to her. I discovered that she is also deaf. We (Simmy and I) have handled that problem. I have taught her our personal sign language, and she understands completely. Also, I had the local veterinary check her out and take an x-ray of her chest, as she seemed to have a heart problem (by my own experience), and found that her heart completely filled her chest. It was extraordinarilly large, and she has trouble breathing. I really can’t afford the heart medicine, but have given her water pills (1/2 two times a day) and she seems to breath a lot better. Since Simmy was sort of at the top of the age scale, I told myself I would NOT get attached to her. I would just give her all of the love that she requested. Well, it is now January 2014, completely attached and love her. She seemed to know from her beginning with me that I would treat her like a queen. When others tried to pet her, she would sort of snarl and snap her teeth. Here’s hoping that Simmy survives another 8-9 yrs, but that might be asking for too much. I will enjoy her until it is her time to go. I never thought I would own a Chihuahua when I was young. My cousin’s grandmother owned many and I remember going to her house being met at the back gate my a bunch of barking nipping little dogs that frightened me. We had poodles at that time and since that time I have had many types of dogs that I have acquired in many different ways and I have loved each and every one of them deeply. 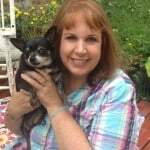 My ex-mother-in-law also had a Chihuahua black male named Lonnie also very barky and nippy. I learned to ignore it but thought I would never have a Chihuahua. Then at a funeral years and years later I was there with my cousin who had the grandmother with Chihuahuas and she laughed and said guess what I have three Chihuahua I dress them and the go everywhere with me I am just like my grandmother she said. I had lost my dog for quiet a few years and was starting to miss having a dog but did not want the trouble again of the care and heart break when they die. Also I no longer had children left at home for them to play with. I visit a retired girlfriend once a year and her son lives next door so he came in on one of my visits to show us the new little Chihuahua he had just purchased to mate with his current chi named Dot which is my name. It was cute and just followed him around not at all nippy. I said if you have a litter I might be interested. That summer every year we have a annual garage sale. My girlfriends, mother, and sister-in-law were on our last legs when this little dog came walking down the drive at us. I said oh, is that one of those Papillion dogs? She said now it is a long hair teacup Chihuahua. Do you want to buy her? I could not believe someone would want to sell their dog. Then I seen her cage it said paid 800 want 200 I said oh 200 right away she said we will take 150 my friends and mother started handing me money urging to me to buy her. I bought her and have spent way more then 150 on her since. But she is my little baby when you get a chi they really really love you like no other breed. She goes most everywhere with me on trips shopping and everywhere I can get away with. She is my heart. They really are like no other breed. They lady I bought her from is friends with me on FB and she said she had to get rid of her but when she seen me she knew I was the right one for Giz. Thanks for letting me tell my stoy. Love your story Dorothy! Please email me some photos (Cathy@ilovemychi.com) and I’ll make your story into it’s own blog post. 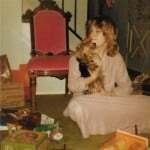 I have always been an animal lover as well as a rescuer. You name it, I brought it home, since I was a small child with the promise that I would find it a home ( I’m not very good at that,I fall in love so easy with animals, so they all stayed lol). In 2007, my uncle was working for immigration at an airport in NY and called to tell me that some woman left behind a very tiny dog. He asked if I knew anyone who would want him. I said, “I’ll come get him and find him a good home.” At the time I had 3 cats,birds, hamsters, frogs, fish,2 small sons and my mom to take care of, plus I worked full time. 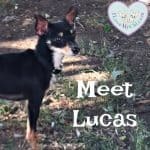 I drove 3 hours to get this fur baby, not even knowing what kind of dog it was or the condition he may be in, just knew I had to save him.When I finally got there, it was love at first sight!There he was, this scared,tiny, 6 lb. chihuahua,malnourished with mange, but had the biggest, sweetest eyes I’ve ever seen. My heart melted on the spot and I wrapped him in a blanket and knew that he would be mine.After vet visits, meds,and home cooked meals, he became this gorgeous,happy,thriving little guy(12.2 lbs) with this huge attitude.I really think that HE rescued me that day, he filled a void in me that I didn’t even know I had.Brings all of us such joy & happiness.I would do anything to make this little guy happy. 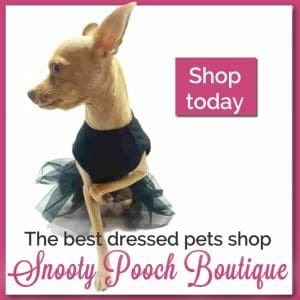 Thank you for having such love for chihuahuas and created this fantastic page. Wonderful story Sandra. 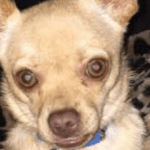 I will repost this into it’s own blog post for our Chihuahua Stories. 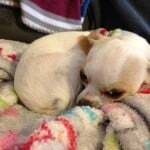 I love the chihuahua stories! We adore the breed, as well. 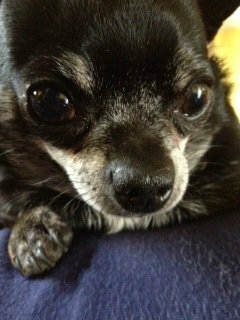 My first was Topsy, a tiny, older chi my first husband & I kind of inherited in 1972. Since then, we have had Ginger, who lived to a ripe old age, and right now we have Watson & Max. Watson was a runt, & is very petite. He will soon be 13 years old. Max was a rescue & at about 16 years old, is still a handsome boy. They have been healthy & have given us a lot of entertainment. Watson has chased a doberman out of our yard (yikes! ), & has flushed up unsuspecting wild turkeys. His favorite thing is to find a snakeskin, bark at it for an hour or so, then shred it. The great hunter! Max pretty much likes sleeping at this stage in his life, but is still perky at times & loves people. We have taken ‘the boys’ on camping trips & other travels. They are very portable & are just happy to be with us. Hello! I am the proud Mommy of 2 Chihuahua’s who have had my heart from day 1. 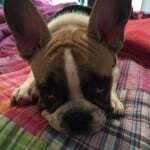 My 1st was my lil boy Chipper that I purchased at 4months old. He was so tiny he would lay in my palm. I had a hard time getting him to eat or drink in the beginning. I had to practically force feed him. He finally started to eat from the palm of my hand & I used a dropper to get water in him. I was so afraid he was going to have his sugar drop & I wasn’t about to let this happen if I could help it. It was a new experience for me but I loved every moment of it. It was like taking care of a baby, my children being grown I didn’t mind at all. The lady I bought him from then gave me a lil girl when Chipper was 2yrs of. He wasn’t mean to her but they did not bond at all. He wanted nothing to do with her. This was sad to watch so I let a friend take her & she had her forever home. She was happy & so was my Chipper. When Chipper was 3 yrs old the same lady gave me another lil girl. She was about the same age as Chipper was when I got him, she was 4 months old. This is close, it’s all written down in their lil diary. She was a lil princess & she & Chipper bonded instantly. It was like they had been together all of their lil life’s. I named her Abigail & she goes by Abi after I knew she was in her forever home. They both are still tiny at age 5 Chipper weighs 4lbs & Abi is 3 weighing 3lbs. They are both Mommy babies, the only difference being Chipper is very protective of me & Abi is very protective of Chipper. I recently had to have 7 of Chipper’s teeth pulled which breaks my heart. You would never know it, it hasn’t affected his eating and he still thinks he is as big & bad as ever. I’m sure Abi will lose some of hers as well. The doctor said this happens more times than not with this small breed. It still breaks my heart but if this is healthier for them that’s what is important. 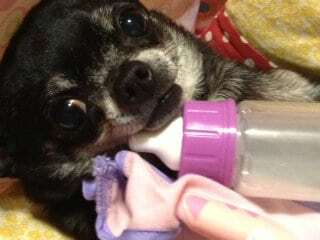 I am so glad to have found you and be a part of your newsletter and other Chihuahua mommy’s. I love reading about other Chi babies and communications with you. Thank you so much, I am so much looking forward to reading & being a part of your site. I will be sharing photos of both babies at a later time.